In Part 2 of 2 of this special forkin’ episode, host (and actor on both The Good Place and Brooklyn Nine-Nine) Marc Evan Jackson talks with Brooklyn Nine-Nine’s Melissa Fumero (Amy) and Executive Producers Dan Goor and Luke Del Tredici. They answer fan questions from around the world and discuss show crossovers, balancing heart and humor, guest stars, and more. The Good Place star Ted Danson (Michael) and show creator Michael Schur shoot the shirt with host Marc Evan Jackson. They talk about the emotional season finale, where Season 4 is heading, the casting of William Jackson Harper (Chidi), the show's approach to writing, and a shirt-ton more funny anecdotes and behind-the-scenes stories. The Good Place associate producer Matt Quezada, actor William Jackson Harper (Chidi), and guest star Nicole Byer (Gwendolyn) shoot the shirt with host Marc Evan Jackson. They talk about shooting a “bottle” episode (all in one location), Nicole’s guest spot as the mailroom clerk and how she approached playing someone in the actual Good Place, Chidi and Eleanor’s (Kristen Bell) date, the evolution of Janet’s (D’Arcy Carden) character, and a fork-load of funny anecdotes and behind-the-scenes stories. The Good Place writers Josh Siegal & Dylan Morgan, actress D’Arcy Carden (Janet) and executive producer/director Morgan Sackett shoot the shirt with host Marc Evan Jackson. They talk about D’Arcy’s performance as all the characters in Janet’s body, how they balanced the complexity of the concept with the budget of a network TV show, the very unsexy kiss between D’Arcy and Kristen Bell and a shirt-ton more funny anecdotes and behind-the-scenes stories. The Good Place writer Andrew Law, actress Tiya Sircar (Vicky), actor Bambadjan Bamba (Bambadjan), casting director Ben Harris and stunt coordinator Jeff Imada shoot the shirt with host Marc Evan Jackson. They talk about catching up with Doug Forcett (Michael McKean) and finally satisfying fans’ questions about him, how Damon Lindelof’s TV show "Lost" informs the writers’ choices, Nick Offerman’s rejection for the role of "Shawn" and a shirt-ton more funny anecdotes and behind-the-scenes stories. The Good Place guest stars Andy Daly (Dave) and Rebecca Hazlewood (Kamilah), as well as graphic designer Graham Ratliff shoot the shirt with host Marc Evan Jackson. They talk about Kristen Bell’s “umbrella rig;” Andy’s portrayal of Ben Franklin on another Mike Schur show, The Office; Graham’s unique graphic design predicaments; the character Rebecca originally auditioned to play and a shirt-ton more funny anecdotes and behind-the-scenes stories. The Good Place writer Matt Murray, actor Manny Jacinto (Jason Mendoza) and actor Mitch Narito (Donkey Doug) shoot the shirt with host Marc Evan Jackson. They talk Mitch’s audition for Mike Schur, why Jaguars fans yell “Duval,” the one thing Matt didn’t want to get cut from the episode and a shirt-ton more funny anecdotes and behind-the-scenes stories. The Good Place writer Megan Amram, actress D’Arcy Carden and editor Eric Kissack shoot the shirt with host Marc Evan Jackson. They talk about how Eric and Mike Schur decide on what scenes to cut when editing an episode, where the afterlife timeline “Jeremy Bearimy” comes from, William Jackson Harper revealing his ripped body on TV and a shirt-ton more funny anecdotes and behind-the-scenes stories. The Good Place production designer Ian Phillips and TV director Beth McCarthy-Miller shoot the shirt with host Marc Evan Jackson. They talk about the differences between the art department jobs, how Beth approaches directing an episode on a new TV show, Mike Schur’s love for cake and banners, Jacksonville Jaguars fans’ influence on the writing and a shirt-ton more funny anecdotes and behind-the-scenes stories. The Good Place writer Dan Schofield and actress Kirby Howell-Baptiste (Simone) shoot the shirt with host Marc Evan Jackson. They talk about Kirby’s audition and her background in improvisation, how the writers’ room named Simone, the return of Adam Scott as Trevor, Marc’s favorite romantic comedy scene in this episode and a shirt-ton more funny anecdotes and behind-the-scenes stories. In the Season 3 premiere, The Good Place writer and comedy maven Jen Statsky and actress Jameela Jamil shoot the shirt with host Marc Evan Jackson. They talk about the writers’ room’s excitement to write Season 3, how Jameela didn’t watch Season 1 until it was over, Mike Schur’s additions to the writers’ room this season, the explanation for Chidi’s American accent and a shirt-ton more funny anecdotes and behind-the-scenes stories. The Good Place creator, executive producer, writer and director Michael Schur shoots the shirt with host Marc Evan Jackson. They talk about the season 3 premiere, how his impeccable memory of other TV shows helps him write The Good Place, the writers’ room’s unique approach to packing more story into a season, the writers’ love for Maya Rudolph’s comedy skills and a shirt-ton more funny anecdotes and behind-the-scenes stories. Actress Kristen Bell shoots the shirt with host Marc Evan Jackson. They talk about the joys of acting with Maya Rudolph with her ability to improv, Kristen’s love of Friday Night Lights and Kyle Chandler, the importance of reactions in a performance, why she wants to know what Mike Schur really thinks of her and a shirt-ton more funny anecdotes and behind-the-scenes stories. Director of Photography David Miller and Set Decorator Kim Wannop shoot the shirt with host Marc Evan Jackson. They talk about veteran actors like Ted Danson and Kristen Bell making David’s job easier, how David’s career switched from pharmacy to filmmaking, where Kim gets all the amazing props we see on the show and a shirt-ton more funny anecdotes and behind-the-scenes stories. Actor Manny Jacinto, writer Tyler Straessle and Tom Zawacki from props shoot the shirt with host Marc Evan Jackson to talk about Tyler writing his first episode of The Good Place, the casts' Comic-Con experience, the comedic specificity of the props, how Manny’s auditions are different now because of the show and a shirt-ton more funny anecdotes and behind-the-scenes stories. Actor Ted Danson and editor Eric Kissack shoot the shirt with host Marc Evan Jackson about the challenges of editing a TV show with such great comedy writing and performances, Kristen Bell’s acting secret, who has been hiding Easter eggs in episodes, an acting tip from Ted and a shirt-ton more funny anecdotes and behind-the-scenes stories. Actor Jason Mantzoukas (Derek) and second assistant director Jeff Rosenberg shoot the shirt with host Marc Evan Jackson. 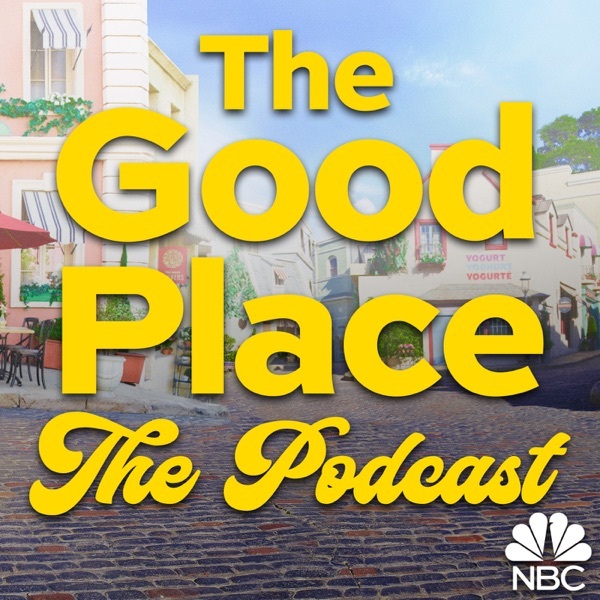 They talk about Jason’s improv and sketch-comedy acting background and discuss performing in the Mike Schur universe in TV shows Parks and Recreation, Brooklyn Nine-Nine and now The Good Place. They also talk about Jeff’s air-traffic-controller-like skills as a key second A.D. and a shirt-ton more funny anecdotes and behind-the-scenes stories. Actress D’Arcy Carden (Janet) and director Dean Holland shoot the shirt with host Marc Evan Jackson. They talk about how Mike Schur has created an impressively complex TV show, how the writing is tailored to the actors and their acting style, what it’s like to direct comedy with Mike Schur, why D’Arcy loves going to work with Kristen Bell, Ted Danson and the rest of the cast and a shirt-ton more funny anecdotes and behind-the-scenes stories. Actor William Jackson Harper (Chidi) and philosophy advisor Dr. Todd May shoot the shirt with host Marc Evan Jackson. They talk about how philosophy informs Mike Schur and the writing team, where “the trolley problem” comes from, William's desire to complete the Kierkegaard rap and a shirt-ton more funny anecdotes and behind-the-scenes stories. Comedy writer Andrew Law and actor Marques Ray shoot the shirt with host Marc Evan Jackson. They talk about the joy of writing jokes for Tahani, Ted Danson’s acting chops, how Michael’s existential crisis hilariously presents itself and a shirt-ton more funny anecdotes and behind-the-scenes stories. Writers’ assistant Lizzy Pace, editor Matt Freund and composer David Schwartz shoot the shirt with host Marc Evan Jackson. They talk about life in a comedy writers’ room, the composing process for music on The Good Place, how Mike Schur generates character names and a shirt-ton more funny anecdotes and behind-the-scenes stories. Actress Jameela Jamil and comedy writer Megan Amram shoot the shirt with host Marc Evan Jackson about Jameela’s first performance acting drunk, how her posh accent slips when she argues, Megan’s hilarious obsession (or maybe mental health issue) with puns, the decline of Jameela’s Instagram handle and a shirt-ton of funny behind-the-scenes stories about The Good Place. The Good Place writers Jen Statsky and Joe Mande and director Trent O’Donnell shoot the shirt with host Marc Evan Jackson. They talk about how Mike Schur forces the writers to act on TV, Jameela Jamil’s stunning fashion, Ted Danson’s phenomenal performance as Michael in Season 2 and a shirt-ton of funny behind-the-scenes stories. Chapter 13: The Good Place creator and executive producer Michael Schur takes a break from the writers' room to shoot the shirt with host and performer Marc Evan Jackson. Michael talks about identifying with TV characters he's written from The Office and Parks and Recreation, the differences in writing and producing artful media vs. big budget entertainment, his nods to Damon Lindelof's "Lost," the funny history behind his Twitter handle and a shirt-ton more. Actress Maribeth Monroe (Mindy St. Claire) and visual effects supervisor David Niednagel shoot the shirt with host Marc Evan Jackson about acting on a secretive TV show, the behind-the-scenes visual effects process, how Maribeth got her start in improv comedy and a shirt-ton more. Comedy TV writer Andrew Law and costume designer Kirston Mann join host Marc Evan Jackson to share stories about The Good Place costume themes, writing for Parks and Recreation and Brooklyn Nine-Nine, conspiracy theorist fans, the attention Mike Schur pays to food in his TV shows and a fork-ton of other hilarious topics. Actor William Jackson Harper (Chidi) and writer Demi Adejuyigbe join host Mark Evan Jackson to shoot the shirt about writing, the similarities between William and "Chidi," the challenges of joining a writers’ room in full swing, how philosophy has influenced their writing and performance process, behind-the-scenes stories including Joe Mande’s Frank Caliendo joke he couldn’t let go and a fork-ton more. Actress Tiya Sircar (Real Eleanor/Vicky) and writer Jen Statsky shoot the shirt with host Marc Evan Jackson about how Tiya’s original audition was for “Tahani,” how the writers’ room is rarely about comedy writing, Mike Schur’s “good-for-something folder” and a fork-ton more laughs and behind-the-scenes stories.